Before heading over to the Franklin Institute, Alanna and Mike got ready for their wedding at The Logan Hotel. In the midst of the excitement, Alanna and Mike’s dog wanted to join in on the fun as well. While getting ready, their dog delivered a love note from Mike to Alanna that brought her to happy tears. After finishing up at the Logan, the wedding party relocated to the Franklin Institute for the ceremony. Alanna and Mike decided to have a unique wedding under the moon and stars at the Franklin Institute‘s Planetarium. Joined by family, friends, and their dog, the pair tied the knot. They truly celebrated an out of this world celebration at this unique ceremony location. After exchanging their vows, the celebration continued in Institute’s rotunda with live musical entertainment from Chico’s Vibe. 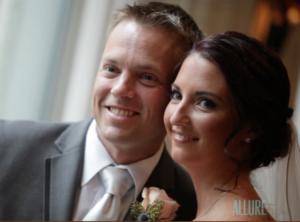 At Allure Films, we love filming incredible and unique weddings like this one. Our friends from Campli Photography also joined us and photographed for Alanna and Mike’s big day. We were grateful to capture all of the special moments throughout such an exciting day. Congratulations Alanna and Mike! We wish you a lifetime of happiness together.